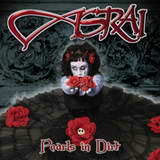 Before posting this I have reread my review of Asrai previous album, 2004 Touch in the Dark. Two years went by but I have to say that I was right, in principle. The only two glaring corrections I have to make are: A) I should not have called this metal, and B) primitive songwriting should qualify for less than “middle of the road”. Labels have changed for Asrai, but otherwise things have stayed the same. Makeup and black leather outfits intact – this is as gothic rock as it comes. Sadly enough where Asrai made absolutely no strides is they didn’t make their songs interesting for me. Prevailing electronics and crunchy chugging guitars, next to steady beats with little variations – no amount of vocal talent and tuneful melodies can save this. Instead of focusing on the songs themselves, the band decided to focus on production, and, perhaps, given some steady inflow of funds with the new label signing, managed to land Sascha Paeth behind the soundboard. Everything sounds much clearer and heavier on Pearls in Dirt comparing to Touch in the Dark, but it does not mean that it is better. Most of the songs are a rather dull mixture of semi-sweet and semi-faceless goth pop (Lost). Your Hands So Cold tries to raise the level of drama with all kinds of blips and effects, but most of the time songs like Awaken sound like cheap theatrics caught between hysteria and horror. The choice for hit single (Sour Ground) puzzles as there are better rockers in the middle of this heap, like Roses. The best moments on Pearls in Dirt are still the ones that feel like darker The Gathering, and it is rather sad when even those get rubbed out by shinier choruses (Something I Said). It gets even worse at times, when absolutely boring rhythmic Go is opened by nothing but a cheerleading chant. The best moment of the album is the real gothic tragedy Stay With Me, its rhythms and chords hammering away, bass booming, but nothing manages to overpower Margriet. Her voice is what really does not let me assign the Crap of the Month tag to this album, as she really separates Asrai from absolutely horrible entities like My Ruin. From higher timbre boyish to lower sultry and seductive, Margriet covers the range and is about the only true attraction on Pearls in Dirt. As I am making fun of my family getting glued to TV watching some Russian Pop-Star Factory reality show, I have to be honest with myself, and pop remains just that, a scheme to extract some coins from the mindless, even if it bears goth tag and is keyboard drenched. The girls (and boys) of Asrai can be dangerous to the minds of unsteady youngsters, because if you let them think this is metal, they will only end up appreciating Manson. So, as much as this has the right to exist in the different subculture of a gothic rock club, listening to this often will help suffocate and kill real metal.